You are currently browsing the Bookmobile News weblog archives for August, 2013. It’s that time of year – time for our annual children’s book drive! We’ve been giving away our current supply at a terrific rate, reaching thousands of low-income and otherwise access-challenged kids around Sonoma County. We’ve kept them growing, learning, and smiling throughout the summer. Now we need to restock, and you can help! Our 3rd year sponsor in this endeavor, United Way of the Wine Country, has organized a vast array of donation points for your convenience. We are especially grateful to Exchange Bank and Hansel Auto Group, who will feature bins at all of their county locations to receive your book donations beginning Monday, August 12. Just choose the one closest to you! We are especially looking for new and gently used books for toddlers, early readers, and teens, in both English and Spanish. 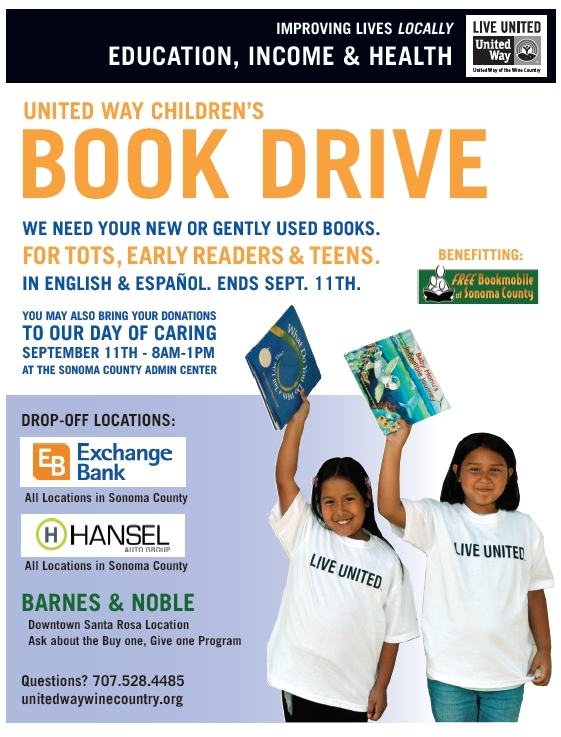 This drive will end on United Way’s Day of Caring, September 11, with a gala event at the County Administration Center from 8 Am – 1 Pm featuring the Free Bookmobile, Redwood Empire Food Bank, Goodwill, and Bloodsource. A fun way to participate is to organize a mini book drive at your work, church, book club or other organization, and then bring us the loot afterward. Amy’s Kitchen, JDS Uniphase, and Rodney Strong employees have enjoyed this project in recent years and are eager to get started again. We appreciate the support, no matter how big or small your group might be! And if you get a good picture of the Free Bookmobile as we make our rounds about town, please consider sharing it with us via email. We love adding fan photos to our growing collection.